Birth defect. I remember the first time I heard the words, something inside me felt instantly nauseated. I felt both a rush of fear and anger. Don’t use that term for my baby! He is perfect! It has taken nearly three years for me to be able to utter those words and accept them with grace. So during this Craniosynostosis Awareness Month I’d like to share our story and Bennett’s journey with you. 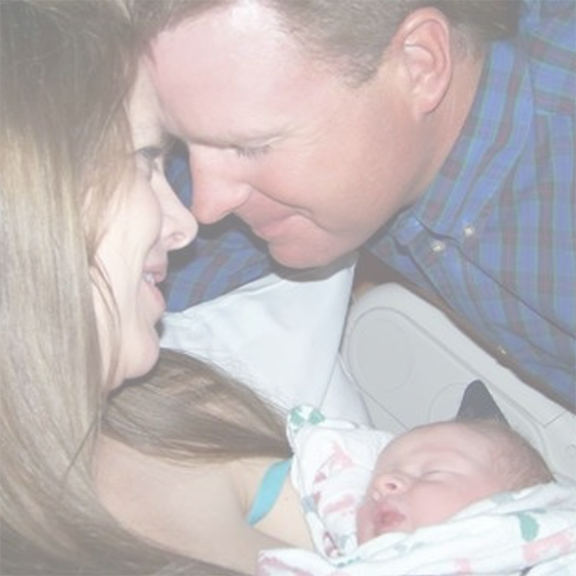 After giving birth six times, and having very similar deliveries and babies, I felt like I kind of knew what to expect. I had given birth at 4:50, 4:51, and 4:52pm. I had given birth to babies on the 1st, 2nd, and 3rd. I had given birth to babies that weighed 7’, 7’1, and 7’2. I had babies that all six had heads in the 25% for circumference and were all within ¼ “ of each other in length. And five of them were boys! So, you might say I had a pretty good cookie cutter approach to babies and deliveries! With each of those deliveries, I had pushed 2-3 times and was holding my precious new baby. You can imagine my surprise when I pushed, and pushed, and pushed, and pushed…and pushed…forever… and was still not holding my baby! The anticipation and anxiety built in the room with each push. And of course, with each push, I offered a whole new round of apologies for the doctor and nurses and my husband and mom that were waiting and having to see the sight!! Even on this my seventh delivery, I felt extremely exposed and mortified at the lack of modesty a delivery requires! I remember at one point even saying to the doctor, “What happens if I just can’t get this baby out! ?” She stayed calm for my benefit, but later admitted that she too thought it might not happen! Each attempt to turn the babies head only yielded a return to position and no luck. I pushed until I thought I had lost all my insides, but indeed, the pushing finally paid off as I held my sixth son! Little Bennett joined our family and was immediately surrounded by the love of six siblings! I remember his bruised and mis-shapen head. It looked so different from all the others. The baby’s doctor assured me it was just from the difficult delivery. But something just didn’t seem right! I looked so narrow and yet oblong. I couldn’t help but wonder what was wrong. 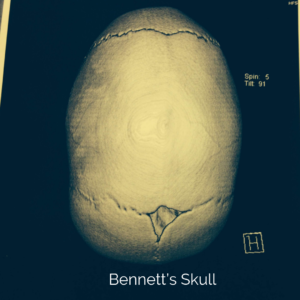 The base of his skull almost appeared to have a section that jutted out. Maybe I was just being overly concerned, but it didn’t seem right. And his head circumference was in the 50% percentile. At each well-baby check, I mentioned my concern. Each time, the doctors would dismiss my concerns and I would hesitate to push too hard, for fear of sounding too pushy or insistent. I didn’t want to sound like a panicky mom. His head circumference continued to increase. His forehead began to look a little uneven, and I couldn’t shake this feeling that something wasn’t quite right. At his fourth month well check, the doctor finally agreed that if it would make me feel better, they would do an x-ray, and refer if necessary. She called and confirmed the x-ray looked good, and said no referral was needed. My concern didn’t disappear. But I tried to convince myself to trust the doctors and not be difficult or pushy. 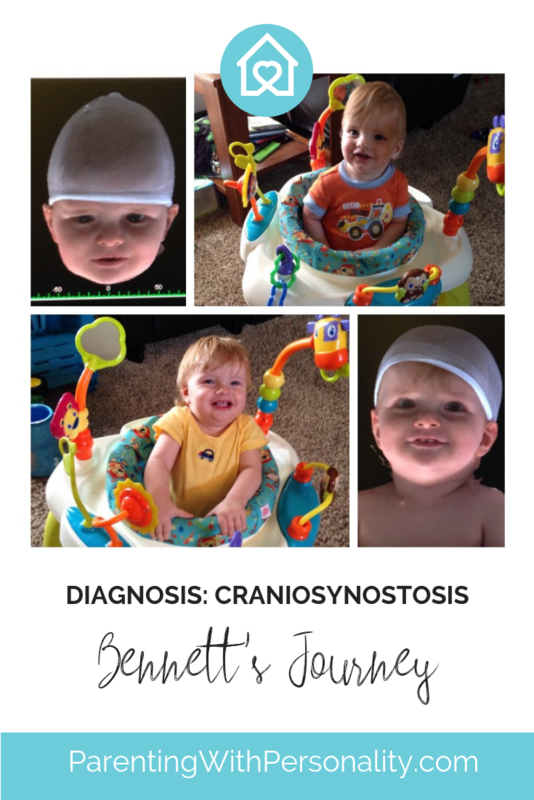 Finally, at Bennett’s eighth month check, his head circumference had grown off the chart (over the 99%). At this point, the doctors wondered if maybe we should see a specialist in Denver. We scheduled an appointment and within moments of seeing the doctor, he knew exactly what it was. Craniosynostosis. Cranio…what?! This sounds like what I had researched back at the four month mark. Could it be? Indeed. Essentially, a baby’s skull has what is termed sutures in their skull, these pieces of their skull meet, but almost appear like cracks. This allows the babies skull to conform and contract during the birthing process and also allows the skull to grow and accommodate the growing brain of a baby, especially in those first two years, but for several years. 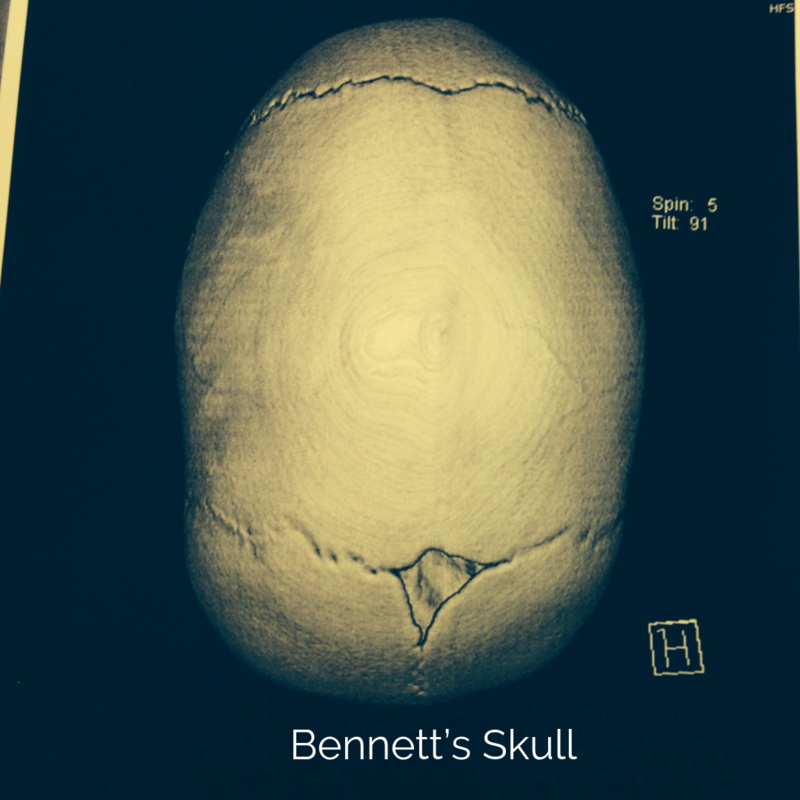 In Bennett’s case, with craniosynostosis, those sutures had already fused. This issue keeps the skull from doing what is necessary during birth and also can constrict the brain from having adequate space it needs as it grows. Studies reveal that this can cause learning issues, developmental delays, intracranial pressure, seizures, or blindness. Without any tests, without touching him, without measuring…just simply looking, it was obvious to this doctor. The doctor explained the surgery and we were like deer in the headlights, that is until the tears came. Then all we could do was sit in front of the doctor and cry. We couldn’t even ask intelligent questions. He gave us all the time we needed. He never hurried us. He never made us feel as though we should just pull it together and let him move on. I will remember this diagnosis as one of our worst and most scary moments in parenting. The details of this surgery sounded horrific. An incision ear to ear to expose the skull, which they would then remove and reshape pieces of the skull…unimaginable! To change something that seemed so strong and stable. To change something about him, so early…while he still seemed so little and fragile. How?! How could it be?! Because of the busy surgery schedule, we had to wait six weeks for his surgery date. During this time, Bennett’s babbling slowed and then stopped. 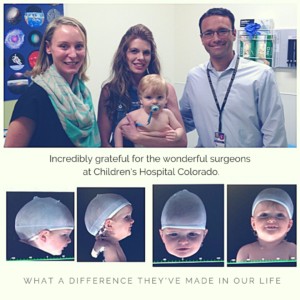 We dreaded the surgery, but knew it was something we needed to do for him. This time of waiting and anticipating and worrying felt torturous. How does a mom keep functioning with the needs of a family with such fear and dread taking residence in her heart and mind? It felt nearly impossible! On August 12, 2015 at 10 months of age, we entered the hospital quite emotional for the surgery. The words of Psalm 139 comforted my heart. Actually, the way God used them to comfort my heart was an incredible story that I will have to share in a future post. I was reminded many times over, through small details in preparation that God had him in his care. I felt like I couldn’t get enough snuggles from my sweet baby to ease my worry. But of course, my mommy’s heart kicked in as I tried to appear as peaceful and calm as I could, so little Bennett wouldn’t sense my fear and feel fearful as a result. I asked the doctors if I could please take him back to the surgery room, so neither of us would have the anxiety of parting ways. I told them I just might be able to get him to sleep and carry him back sleeping. The anesthesiologist laughed and said that most moms thought they could, but in all of his years, he had never seen it happen! Challenge accepted! With my largest prayers in the history of mothering, I prayed that God would allow Bennett to fall asleep and stay asleep, (I asked for a “supernatural Jesus sleep”) so I could carry him back. I think God knew how much this meant to my heart and it worked!!! I was allowed to carry him back while he slept peacefully in my arms. The anesthesiologist prepared me for what would happen as his muscles responded to the anesthesia. Amazingly, he didn’t jolt, jerk, or move…just slept peacefully in my arms. The anesthesiologist was astonished! He had never seen this before! He told me I could place my sweet little one on the table and give his cheek a kiss. I noticed the huge team of surgeons and nurses waiting to care for my little one. I noticed his sweet little face on their computer screen, and I looked upon him sleeping on the table that would hold him for the next several hours. While I had dreaded this moment for the past couple months, I felt peaceful as I kissed his soft little cheek, and whispered, “I love you sweet one.” I sensed peace in the room. I was able to turn and walk out, knowing that he was being well cared for…and surrounded by angels! Yes, some tears may have slipped from my eyes, but I kept that picture of peace instead of the numerous graphic Google pictures of the surgery that I had viewed for the past couple months. After nearly five hours, the surgeons came and told us the surgery was complete. He had done well and only needed a small amount of blood in a transfusion. Within just a short time, they were ushering us back to recovery where we would see him for the first time. I was scared about what I would see. I was scared about what I would feel. I was just pure scared. But all that passed as I saw him lying in the hospital crib. I wanted to cradle him in my arms and never let him go. I took a few minutes to watch him breath and take in his new appearance. It was amazing that it already looked so different. But it wasn’t bad, just different. In fact, it looked beautiful! He still looked like my baby. When I was ready, I took a look at the incision. What a reminder of all this little one had just endured. The incision was a wavy cut from ear to ear. They had exposed everything down to his cheek bones, removing his forehead to reshape and replace it. They put five stair-stepped cuts in the sides of his skull and removed a strip that was about 2”x6” (known as a strip craniectomy—the term they confirmed as we arrived at the ER and it nearly made me pass out, just hearing it!). They were working to keep him comfortable, with his pain under control so he could rest. I slept sitting upright in the chair for the next couple nights and put him down only to change him or let him be checked. This seemed to minimize the swelling. Amazingly, on day two he flashed his winning smile. Who would ever imagine that these little ones would have such resilience and sweet spirits after enduring so much!! 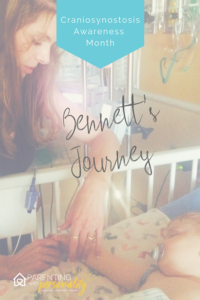 We were slated to leave the hospital on day three, but some issues with dehydration and nausea from meds, combined with soreness keeping him from nursing effectively kept us there for six days. But I didn’t really mind. I felt like while we were there we had the watchful eyes of those who knew what to do. What would I ever do at home with a baby that felt so fragile. And how could I ever keep him safe in a busy home with six active siblings?! I felt very inadequate. We returned home, and honestly, Bennett was a trooper. I was thrilled at his ability to smile and jabber and carry on like a champ. I on the other hand, felt like I had been horribly traumatized by the experience. I was tearful and fearful and overwhelmed. I was sure most every other mom handled it better than I was, so I kept it in and struggled through the anxiety. It took quite some time for me to work through the experience and all that it had affected in my mother’s heart and emotions. I will never forget this experience. While it was just a piece of Bennett’s journey, it will be unforgettable in my heart. I am certain God has given him a special gift of courage and resilience, not to mention joy. I mean, I know I wouldn’t be smiling the day after having my skull taken apart or removed! He is a special little soul…a gift…a blessing. His name had been well chosen…little blessing! And none of this had taken God by surprise. He had him in His hand the whole time. Yes, big lessons were to be learned for me, as his mom. Primarily, I learned a big lesson about trusting my mother’s gut. I knew early on that something wasn’t right and oh, how I wished I had insisted and advocated for quicker care. I wish I had known that a parent could request a referral. I thought that had to come from his doctor. I wish I had been more forceful in getting him what he needed. There were painful lessons to learn. It has taken some time to share this story with others. But I have also learned that there are many families going through this journey. And if our story can offer support or encouragement to even just one other person, it is so worth discussing! We are incredibly thankful to Bennett’s wonderful team of surgeons at Children’s Hospital Colorado. Dr. French and Dr. O’Neill were beyond caring, competent, and compassionate. We couldn’t have asked for better care! I have never experienced anything like them! 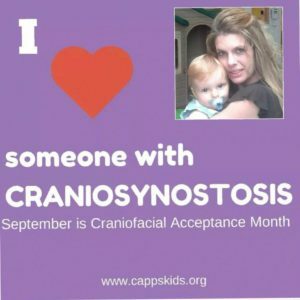 Through the facebook pages and groups (such as Cranio Care Bears and Cranio Kids—Cranionsynostosis Support), I have been able to connect with moms, even across the world, as they travel this path with their little one. It is amazing the support and connection you can feel with someone you have never met when suddenly you are experiencing similar situations with a child. How many times do we question ourselves as Moms? Or think that we don’t know what we are really talking about as parents? In next week’s post, I’d like to spend a little time talking about trusting your mother’s gut. Stay tuned next week for part 2 in this blog series.